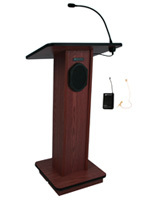 This walnut adjustable height lecturn features a full built-in sound system for convenience. 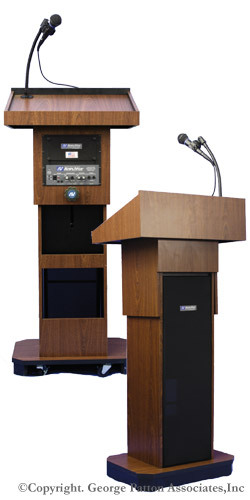 Each sturdy presentation lectern comes with a 50-watt amplifier, integrated speakers, and a slim gooseneck microphone wired into the stand as well as a wireless lapel mic. 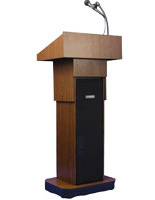 This elegant adjustable height lecturn raises and lowers to heights between 39" and 45" tall as needed using the pneumatic control adjustment dial. 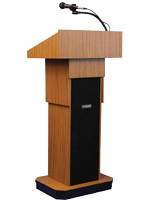 The solid wood presentation pulpit has a rich natural finish and includes two wheels in the base for easy movement. This versatile height adjustable lecturn with integrated sound system is designed to handle up to 10,000 square feet of space. 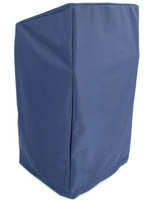 The 50-watt amplifier in the sound column is UL listed for safety, and is manufactured in the USA.